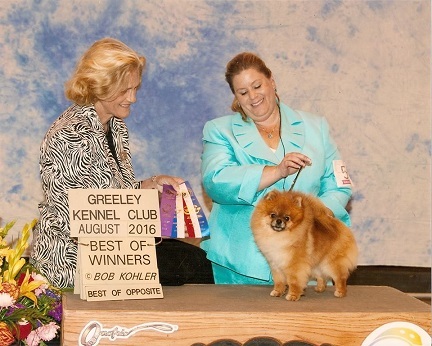 Cosmo was bred in a joint effort of Northmoor and Pruden Poms and will stay as a show hopeful. Cosmo's parents are Magic (CR Midnight Magic At Starlight) and Bianca (Pruden's Wrapped In a Bow). We are ever so grateful to Marilyn Smith of Starlight Paws for allowing us to breed to Magic and named Cosmo adding "Starlight" in her honor. Although Cosmo is still young, he has come out to play in the ring. He will be back in the ring in 2015.